Working through tough times isn’t easy. It always seems more comfortable to turn the other way and try to outrun the storm. But invariably, the problem won’t go away, it just lasts longer and gets worse. We need to turn and face it head on. Sometimes, life is so overwhelming that you don’t know where to start. Marriage problems, health issues, financial pressures, work, teenagers, bills, the list can on and on sometimes. When life seems like a storm, be the buffalo. Put your head down and take a step. It can be a small step at first, something manageable, something that gets the momentum started. Then take another step, and another. I don’t know how long your storm will last or how intense it is. 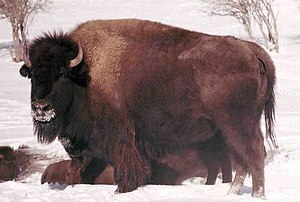 All that I do know is that the buffalo gets through it quicker and in better shape than the cow. Previous post – Get in the Game! « Get in the Game!